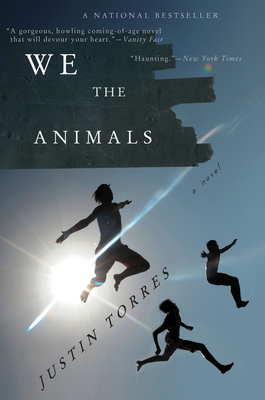 "The imagistic power of Justin Torres’ debut, We the Animals (Houghton Mifflin Harcourt), exists in inverse proportion to its slim 128 pages. Just try shaking off this novel about three upstate New York brothers whose knockabout childhoods with their Puerto Rican 'Paps' and white 'Ma' are the narrative equivalent of feral kitties being swung overhead in a burlap bag." "An exquisitely crafted debut novel—subtle, shimmering and emotionally devastating...the narrative voice is a marvel of control—one that reflects the perceptions and limitations of a 7-year-old in language that suggests someone older is channeling his younger perspective. In short chapters that stand alone yet ultimately achieve momentum, the narrator comes to terms with his brothers, his family and his sexuality, separating the 'I' from the 'we' and suffering the consequences. Ultimately, the novel has a redemptive resonance—for the narrator, for the rest of the fictional family and for the reader as well. Upon finishing, readers might be tempted to start again, not wanting to let it go."